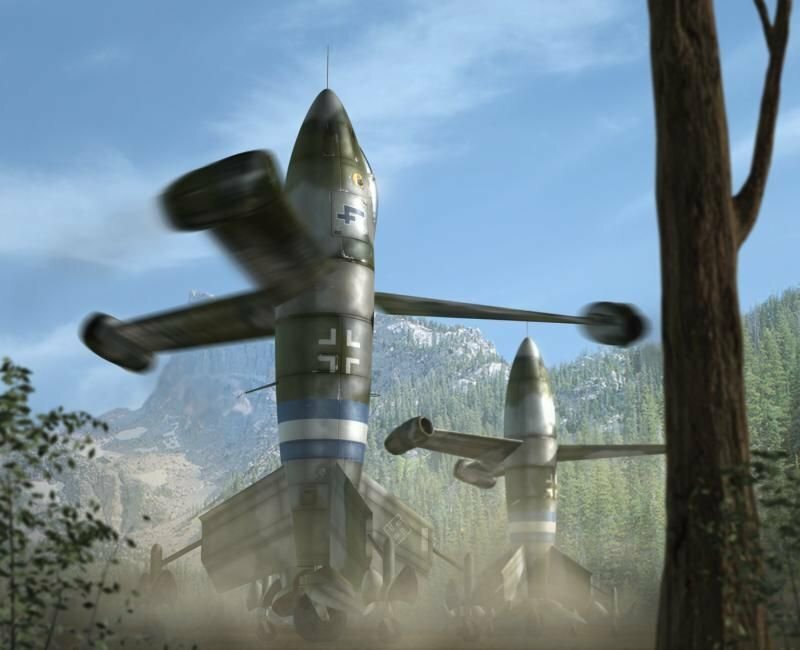 Designed in 1944, the Focke-Wulf Triebflugel or Triebflugeljager (meaning Thrust-Wing Hunter) was a vertical take off and landing concept for the increasing Allied bomber threat. The Luftwaffe wanted a craft that didn't need runways because the Allies were destroying the airfields which prevented fighters to be able to take off. Many designs were made but the Triebflugeljager stands out the most. Instead of wings, the Triebflugel had rotor blades with a ramjet at the ends. The blades were to be attached to the fuselage with ball bearings so they could move freely. Like helicopters, the blades could tilt to determine the speed of the aircraft. The fuel tanks were to be located in the fuselage and the fuel pipes used pumps to reach the ramjets. This design allowed the aircraft to take off vertically and fly normally for intercepting Allied bombers. Landing though, would be very hard, to land pilots would need to slow the aircraft down, point it vertically and slow the speed more to descend to the ground. To make it harder, the cockpit had a bad rear view and the blades wouldn't help. The armament called for two 30 mm MK-103 with 100 rounds each and two 20 mm MG-151 each with 250 rounds. But because the nose of the craft had to be pitch upward slightly, the guns were made to point downwards slightly. With three Pabst ramjets dispersing 2000 Ibf, the top speed would've been 620 mph. The Triebflugel only reached the wind tunnel testing when the American Forces reached the site it was designed and no prototype was ever built. Although, there are rumors of test pilots saying they flew in the Thrust-Wing Hunter but these accounts have never been confirmed.